Painting stripes on the wall is one way to make a room feel larger. For some, painting a room is a chore to be completed as quickly as possible, but for others it's a chance to exercise artistic creativity. If you're of the latter type and you're looking for a way to alter the spacial feeling in a room, try painting stripes. Vertical wall stripes make a ceiling appear higher, much like vertical stripes on clothes make a person seem taller. Horizontal stripes, on the other hand, make opposite walls seem farther apart. Besides these alterations in spacial perception, stripes also lend a quality of old-style elegance—think sumptuous plantation mansions in the deep South. Stripes look best when they aren't too wide. Designers recommend a width from 4 to 12 inches. While sharply contrasting colors can be dramatic and interesting, they can also be jarring, so unless you're painting a party room, you should probably stick with colors that are close together in hue. A good strategy is to choose the colors from the same color sample card, but there's no rule to it. If you want to use paint that you already have, there's no reason why you shouldn't. Divide the wall width by an odd number to guarantee matching stripes int he corners. Stripes don't have to all be the same width, but a room will generally feel cozier and more relaxing if they are. To figure out how many stripes will fit on the wall, measure the length or width of the wall —depending on whether you're painting vertical or horizontal stripes. Divide that measurement by any number to determine the width of each stripe and the number of stripes to paint. Keep in mind the standard width range, between 4 and 12 inches. If the number is odd, it guarantees the stripes in the corners are the same color and contributes an element of uniformity. For example, suppose you're painting horizontal stripes on an 8-foot wall. Divide the wall height (96 inches) by 9, and you'll end up with nine horizontal stripes, each with a width of 10.7 inches (round up to 11 inches), and matching stripes at both the floor and ceiling height. On the other hand, you could divide by a larger number, say 21, to get narrower stripes (4 1/2 inches) and more of them. Use a level to make sure your stripes are perfectly vertical or horizontal. You can paint stripes over an existing wall color, but in most cases, you'll probably want to change the color by applying a fresh coat of paint. Give this undercoat at least 4 hours to dry before laying out the stripes. Wait overnight if you can. The longer the paint has to dry, the less chance there is that it will come off when you remove the tape used to lay out the stripes. Use a tape measure and a colored pencil with a hue close to the wall color to mark the positions of the stripes, then draw them on the wall using a level and a straightedge. A level is an essential tool because if the stripes aren't exactly vertical or horizontal, your eye will notice it. After drawing the lines, lay painter's tape along each one, keeping the edge of the tape flush with the part of the stripe you're going to paint. Before you paint the stripe, it's a great idea to apply one more coat of the underlying base color onto the stripe area, directly over the tape. Allow the paint to dry for 2 to 3 hours and it will seal the edge of the tape, preventing the top stripe color from seeping and guaranteeing a clean, straight edge. 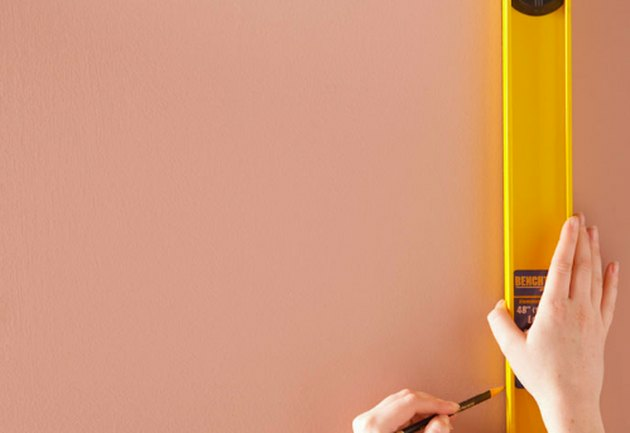 Remove tape carefully to avoid pulling paint off the wall. 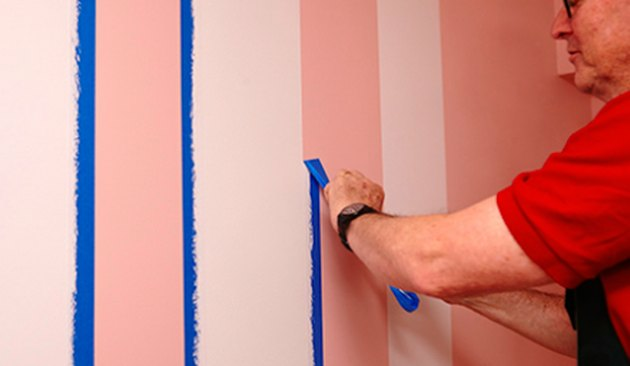 Once the tape is in place, simply apply the stripe color with a brush or roller, being sure to completely cover the edge of the tape that defines the stripe. Unless the colors are very similar, you'll probably need two coats. Let the first coat dry for about 2 hours before applying the second. Removing the tape is probably the most critical part of the entire procedure. You should do it about an hour after painting the final stripe coat, while the paint is still soft enough to separate easily at the tape line. Pull the tape slowly and gently, angling it down and away from the wall. Be careful to avoid getting wet paint on the wall, the floor, or your clothes. Keep a plastic garbage bag handy and deposit each piece of tape directly in the bag as soon as you remove it. That way, you won't accidentally step on a piece of tape with fresh paint and track the paint all over the room. Do Vertical Stripes on a Wall Make the Room Look Smaller?